Our 5-Star classification designates those select properties that provide exquisite service and amenities. The discriminating traveler will find the accommodations, ambiance, dining, and staff assistance of the highest caliber. These properties offer the utmost in luxury and will provide an outstanding experience. Fragrant grounds, azure waters and palm-fringed lagoons are the hallmarks of this relaxing and sophisticated beachfront resort. 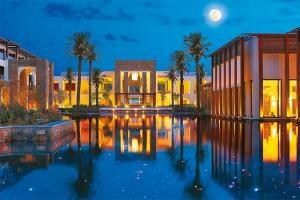 Amirandes offers the highest standards of Mediterranean luxury. All villas feature indulgent high tech details such as home cinema, private gyms and state-of-the-art bathrooms with color therapy and aromatherapy Jacuzzi bathtubs. Amirandes is ideally situated approximately 10 miles from Heraklion international airport and the archaeological site of Knossos, renowned for its famous Minoan Palace, the seat of the legendary King Minos. Amirandes - Mediterranean Cuisiene, Lago Di Candia - Fine Dining, Minotaur - New Italian Cuisine, Petrino - Seafood Al Fresco, Xasteria - Cretan Organic Cuisine, Blue Monkey - Asian Cuisine, Labyrinth - Lagoon Bar. Aquaworld Aquarium, Elafonissi Beach, Lychnostatis Open Air Museum, Balos Beach and Lagoon, Les Gorges d'Aradena.